I've been cloth diapering the twins for close to two years now. It's become such a part of my daily life that I don't think about it much anymore. It was the right choice for our family, because we like to reduce our carbon footprint where we can, and because it was cost effective. But it was also a good choice for our family because I've got one child prone to diaper rash, and another prone to eczema, and soft cloth diapers make for happier bottoms. Plus, cloth diapers have personality! I've always wanted to do a cloth diaper review, but had never had the opportunity, probably because I just don't blog about it too often (even though it is our primary form of diapering, and I do love it). Recently, Jungle Roo Cloth Diapers sent me a direct message on twitter to see if I would be interested in doing a review and giveaway for them. So I went and checked out their website and loved all their fun choices - giraffes and sharks and all sorts of cuteness to choose from. I picked the tiger roo minky - my high school mascot was the tiger, so I'm still a little partial. 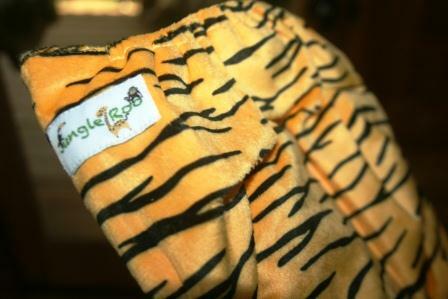 The tiger minky roo has a leakproof exterior suedecloth lining that will not pill after numerous washings. Three rows of rise adjustment snaps allow it to fit from 9-30 pounds and the hip snaps prevent wing droop. The diaper includes a 3 layer microfiber insert. Reid was a little bit shy about modeling diapers. 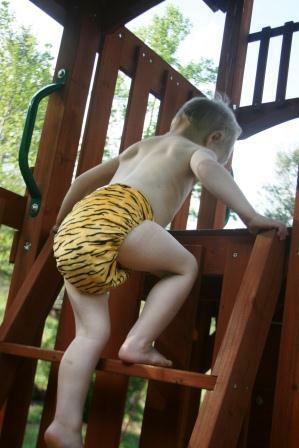 Meanwhile, Cort was quite jealous, begging for a chance to wear the "tiger diaper" and have his picture taken. Cort, however, is potty trained, so he was out of luck this time. I thought the fit was really good. As Reid romped around I didn't notice any big gaps in the legs or anything. He seemed quite comfortable in it as well. The microfiber insert wasn't quite as thick as some others we've tried, so if you have a very heavy wetter at night, you might want to use a second insert. They have extra inserts available at very reasonable prices. Personally, we didn't encounter any leaks, so it was effective for us as is. And the cuteness factor on these diapers is outstanding! Want a chance to win a Jungle Roo Cloth Diaper? It's the perfect way to celebrate Earth Day, one of my favorite holidays! Just click on the "Read More" beneath my signature for a chance to enter. You might check them out on twitter and Facebook. They are doing a fantastic sale right now through Earth Day of their bestselling 6 packs of diapers for $99. You can also use the code TWOBEARS for an extra 18% off any order, from now until May 1st. Disclaimer: I was provided with one Jungle Roo diaper for review purposes. The opinions stated above are my own. Wow! 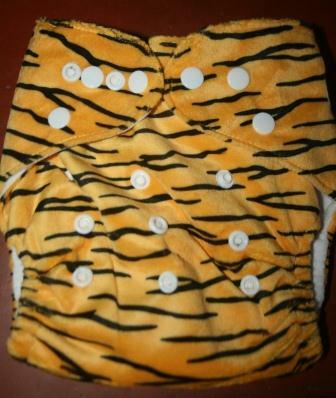 Cool tiger diapers. What a wonderful idea. You can have all sorts of animal patterns like zebra, too, or even some super hero characters! Hahahah.... they are all so cute. I think I like the Giraffe Roo next to the one you picked. Did you read the post where I mentioned we have a new Grandbaby on the way? He's not going to want to see this post in 3 or 4 years!! Aw! 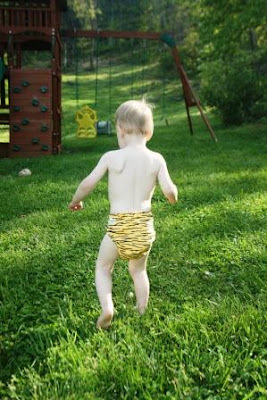 He looks like a little Tarzan in that diaper! Too cute! Too cute!!! You'd think that someone would have thought of this a long time ago!! Giraffe Moo Minky!! How cute!!! I have just been researching cloth diapers as I want to try to switch over with my last babe! Would love to try these out! THe Giraffe Minky is super cute! I wish I could wear those adorable diapers! He does look like a little Tarzan! I love the tiger print. Kudos to you for using cloth diapers so long. I like the froggy green design. I love that Cort wanted to try them on. :) I entered the giveaway because my SIL is planning to use cloth with her baby! First of all, your little man is adorable is his cool diaper!! I would either choose the one you did or the giraffe roo minky! We've been considering cloth diapering our twins but as I'm looking around at the options, it all seems sooo expensive to get going. I cloth diapered my youngest daughter and the savings was incredible...but I got a steal of a deal on diapers on ebay! I love the froggy green or flamingo pink! I love love love the cow roo minky diaper, I've been looking for a cow print cloth for awhile now! I like the cow print! I love the Giraffe Roo. I like the Giraffe Roo! I like the Froggy Green. I love Jungle Roo Purple! These are really cute diapers and I like the suedecloth that doesn't ever pill. I love the designs especially the Jungle Roo White. I like jungle roo purple - very cute! Really love the Giraffe Roo Minky! I like the shark roo! I LOVE the cow roo minky diaper. I love cow print!!! My favorite is Jungle Roo White. I like the giraffe roo minky! Cute print, and I've not tried a minky diaper yet! I love the Cow roo! I love the Tiger Roo Minky. My favorite is the cow roo-minky.